In a unanimous vote at its July 12 meeting, the Long Beach City Council approved the sale of the property at 200-232 Long Beach Blvd. to Broadway Block LLC, a development partnership between Ratkovich Properties LLC, Urbana LLC and The Owl Companies, for $7.85 million. The 50,000-square-foot space on the southeast corner of Long Beach Boulevard and East Broadway is currently being used as a temporary parking lot and is adjacent to land previously purchased by Broadway Block, including the Acres of Books site. Broadway Block has partnered with Cal State Long Beach’s graduate school of fine arts and will provide affordable housing for students and teachers, as well as creative office space, and an adjacent “academia court” for student galleries, performing arts, receptions and other university-related activities. The development proposal includes 141 residential units, 10% of which are designated for CSULB, in a seven-story structure. The project will also contain 3,200 square feet of university space, 5,212 square feet of retail space and 3,873 square feet of flex space. Also included in the proposal is 6,200 square feet of outdoor networking and meeting space and 190 parking spaces. Broadway Block will integrate the development into an adjacent proposal by a series of pedestrian paseos and courtyards. When combined with the adjacent proposal, the development will include 375 residential units, 5,773 square feet of creative office space, 3,873 square feet of flex space, 6,012 square feet of loft space, 1,311 square feet of ArtExchange space and 3,200 square feet of university space. Total parking requirements for the site are 511 spaces; however, 524 spaces are included in the current proposal. In June, five proposals were received by the city. 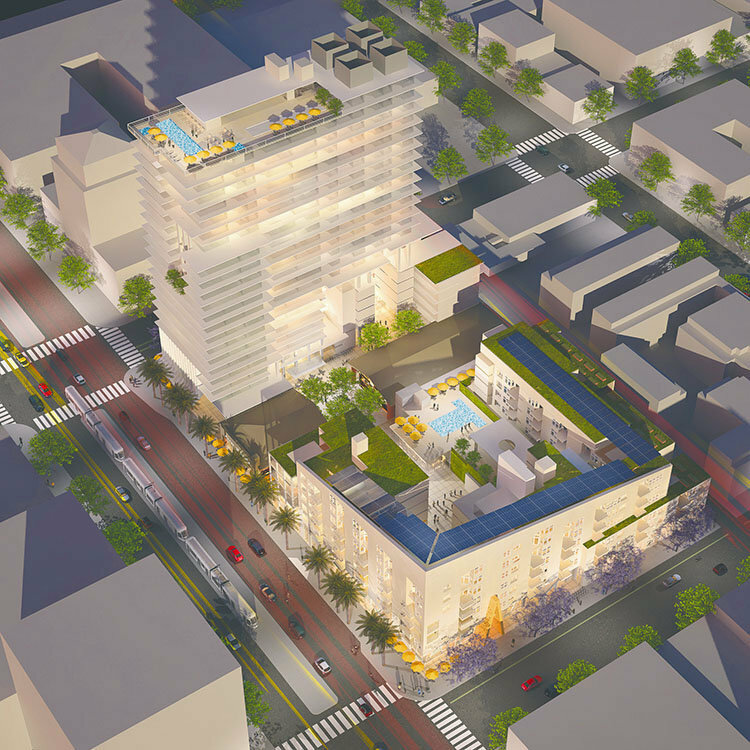 Of the five, Broadway Block’s proposal had the highest development investment at $154 million. “Together with the affordable [housing] component and the creative synergy achieved through assembly and joint development, the review panel believes the proposal submitted by Broadway Block LLC offers the best value for the city,” Michael Conway, Long Beach’s director of economic and property development, said during the council meeting. During public comments, frequent meeting attendee Larry Goodhue questioned the project’s lack of an endorsement by the city auditor and asked for approval to be postponed until it has an endorsement. Jenna Kingkade, a law student at University of California, Berkeley, questioned the legality of the sale in light of the California Surplus Land Act, which states affordable housing developers must be given priority when accepting proposals for surplus land sales. “All of the [former Redevelopment Agency] properties were processed through the Surplus Land Act to assure that we would be able to proceed with these sales,” Conway said in response to Kingkade’s questions.